Send your comments on the 195 Street Grid proposals to Melanie Jewett in the Planning Department and/or Lambri Zerva at RIDOT. The city is taking comments on the 195 Street Grid until Tuesday, but we still have some more to say about it, so let’s look at the streets on the West Side. The west side streets are pretty simple, knit back together the street grid that was interrupted by the highway. Kind of a no-brainer and that is exactly what RIDOT proposes more or less. There a couple little things that should be considered though. RIDOT proposes Friendship and Clifford Streets to be two-lane one way streets. Friendship eastbound and Clifford westbound. Let’s look at Friendship in more detail. The Friendship Street we know today runs between Dyer Street and Chestnut Street, meeting Chestnut just under the overpass. Friendship was truncated when the highways were built. The other portion of it is west of the Service Road and runs southwesterly to Broad Street. Part of Friendship Street used to be an on-ramp from the Service Road to 195 east. Today’s Friendship Street is a one-lane one way street with street parking on one or both sides (depending on its width on various blocks) running northeastward from Chestnut Street to Dyer Street. On the newly constructed portions of Friendship Street, between Chestnut Street and the Service Road (East Franklin Street), RIDOT proposes two 12′ travel lanes (one marked with sharrows for bikes) and a 12′ parking lane for a total road width of 32′. The street will also feature 8′ sidewalk on either side. First, those sidewalks are way too narrow, they should be at least 10′ wide, and the wider the better. Like I said before, Friendship Street is currently one-lane. I don’t see the need for two lanes. Yes, it will be one of the primary crosstown streets (though it will not have a bridge over Route 95, Clifford will though), but we have many main streets in the city that are one lane wide now, including Friendship Street. Westminster, parts of Weybosset, Thayer, Pine, Mathewson, Richmond (where it is one way), Chestnut (where it is one way) are all one lane streets. The only reason I can see for more lanes is to move more traffic faster, moving traffic faster should not be a goal here. These two travel lanes present another issue on the existing portions of Friendship Street. 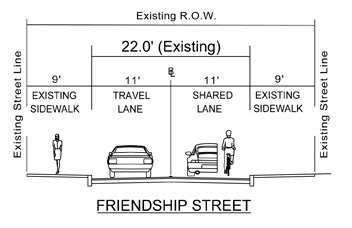 Between Chestnut and Richmond Streets, Friendship only has a 22′ right-of-way. 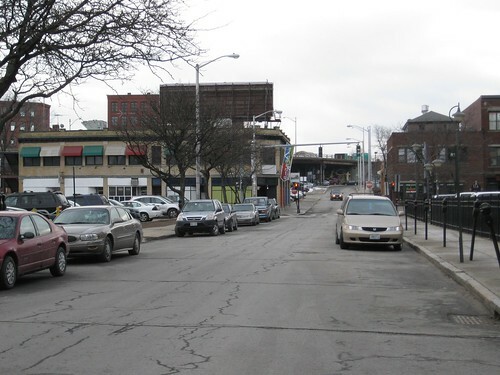 RIDOT is proposing two 11′ travel lanes and no parking lanes on this portion of Friendship, where currently there exists one lane for traffic and one lane for parking. Now anyone who reads this site regularly is aware that I do not subscribe to the theory that we have a parking crisis, but removing street parking is not a good thing. From Richmond to Dyer where the street widens out a bit, it appears that RIDOT is planning for two travel lanes and one parking lane, in an area where there is currently parking on both sides of the street. There’s a number of issues with removing existing on-street parking. First there is perception. People who think it is so terribly difficult to park in Providence will lose their heads if they see parking being removed. Then there is revenue, the city has meters on Friendship Street, if you remove those spaces, the city loses that meter revenue (not to mention revenue from tickets). Third is street feel, when their is a row of parked cars, it separates pedestrians from the traffic lane, providing a buffer that makes pedestrians feel safer. That section between Chestnut and Richmond is going to feel like walking along a highway if it is two lanes with no parking buffer. 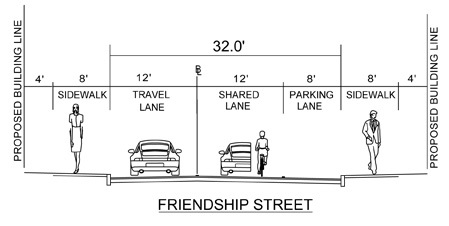 Both Friendship and Clifford Streets should be rebuilt with one wide travel lane (to allow for room for bikes to share the road and stay clear of the door zone) and parking on one or both sides where the width of the right of way permits. Room saved in the right of way by having one travel lane rather than two should be dispersed to the sidewalks. I know what you’re saying, “abandon Ship Street, now he’s really gone crazy!” I’ve been crazy for a while, but I’m not saying the whole street, just a portion, take a look at the Ship, Chestnut, Clifford intersection. Currently, Chestnut Street is one way southbound into the this intersection, then (amazingly, considering it’s width) two-way south of the intersection. Ship Street is one way southeast bound out of the intersection, and Clifford is one way eastbound and ends at the intersection (the rest of Clifford is currently under the highway). RIDOT proposes that Chestnut be two way it’s entire length (meeting Empire which will be made two way as soon as this spring). Clifford will turn around and will now run westbound. 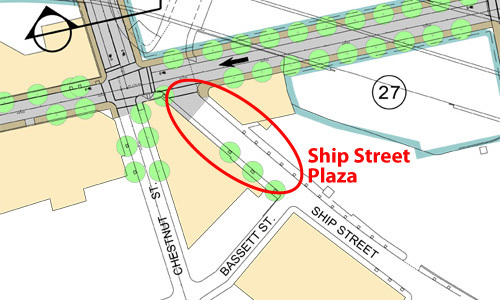 And when I asked about this, the RIDOT representative said that Ship Street would be running northwest bound into this intersection (which means Ship Street would be turned around from it’s current direction). I look at this intersection with all this traffic moving into it from various directions, some roads one way, some roads two way, J&W and Brown students all over the place, people on bikes, and I see a big mess. I’ve stared at the map trying to come up with a sensible way to make this intersection more, sensible. Between Dyer and Richmond Streets, there is an area with underground utilities which must remain clear of buildings. This is off-handedly referred to as a shared use corridor by the city and RIDOT. It will be undeveloped, it won’t be a street with cars on it, but someday it may be a landscaped pathway for pedestrians and/or bikes. I can understand everyone wanting to be noncommittal about this space as no one has any money to develop it fully. If the city were to say “we’re gonna have this cool pathway here,” then it not show up for years, there would be many cranky people complaining about it. We can and should plan for it now though. 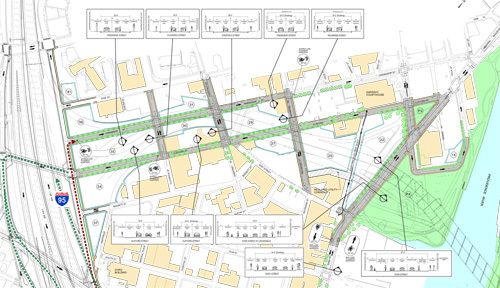 There is a small bit of planning for it in the RIDOT plans already. You can see on Dyer Street there is a neck-down and a crosswalk where this path would reach Dyer Street. Across from there is the waterfront park and a very likely good place for a path to/from the pedestrian bridge over the river to meet Dyer Street. So there is some good forethought there, yay. What about the Richmond end though? Brown has proposed improvements to Richmond Street which may include a pocket park at the corner of Richmond and Ship, hey whaddaya know, right across from the end of this path. Then it is just a hop, skip, and a jump (actually just a hop and a skip) to my proposed Ship Street Plaza. Then, Johnson & Wales is planning for open space in it’s expanded facilities between Friendship and Clifford Streets. See what’s happening here, a greenway of sorts from the highway to the river cutting diagonally through the Jewelry District. Even if this shared use path through the utility corridor consists of nothing more than an asphalt path and some bark mulch until someone gets some money to pretty it up, it is a strong link in a chain, and the connections between those links should be thought of now. What are the desire paths going to be? Are the sidewalks wide enough? Are the crosswalks in the right places? Where should bus stops be in relation? How will bikes use this pathway? We’re only going to rebuild these streets once, so let’s dot all our i’s and cross all our t’s here. This is the eighth of a series of posts we will be doing about the 195 Street Grid. To view all the posts and more information, please visit our 195 Street Grid page. Due to the national economic and real estate meltdown not much will be built on the 195-land any time soon. Even a partial build-out would not likely be completed in less than 4 to 5 years. The current street design with multiple lanes is based on calculations for a full build-out of the district and current transit use patterns and availability. Any significant construction that takes place in the district would likely coincide with the startup of the downtown streetcar lines. Also in 4 or 5 years the South County commuter rail will already have reached Wickford and perhaps Kingston or other stations. These improvements in transit would dramatically modify the traffic formula that RIDOT has used to design these streets. 1. Propose a less aggressive design with fewer travel lanes and more on-street meter parking for the first 5 years or 50% build-out. 2. Street striping and use could be modified using the current more aggressive plan for the period following 5 years or 50% build-out. A condition could be made that would require full analysis and public review of the effects on transit improvements and effect on the district before implementing the more aggressive street design.